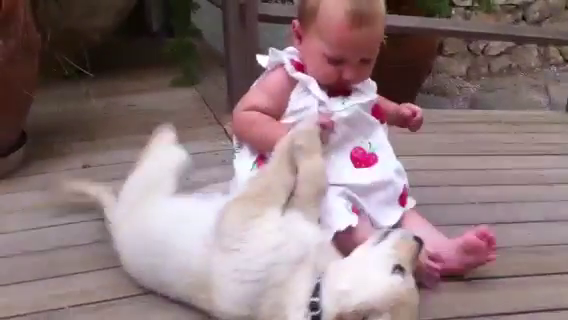 A 2-month-old Golden Retriever puppy is delighted to meet an 8-month-old baby who has come over for a visit! The Golden Retriever is a medium-sized breed of dog. They were historically developed as gundogs to retrieve shot waterfowl such as ducks and upland game birds during hunting and shooting parties. They were named retriever because of their ability to retrieve game undamaged. Golden Retrievers have an instinctive love of water. They have a dense inner coat that provides them with adequate warmth, and a water repellent outer coat that lies flat against their bodies. These dogs are well suited to suburban or country environments. Although they need substantial outdoor exercise, they should be kept in a fenced area because of their instincts as hunting dogs and tendency to roam. The Golden Retrievers' intelligence makes them versatile, allowing them to fill a variety of roles, including guide dog for the blind, hearing dog for the deaf, hunting dog, illegal-drug detector, and search and rescue participant. Because of their loyal and gentle temperament, Golden Retrievers are also popular family pets. The temperament of the Golden Retriever is a hallmark of the breed, and is described in the standard as "kindly, friendly and confident". Golden Retrievers make good family pets, particularly as they are patient with children. They are not "one man dogs" and are generally equally amiable with both strangers and those familiar to them. Their trusting, gentle dispo sition makes them a poor guard dog. 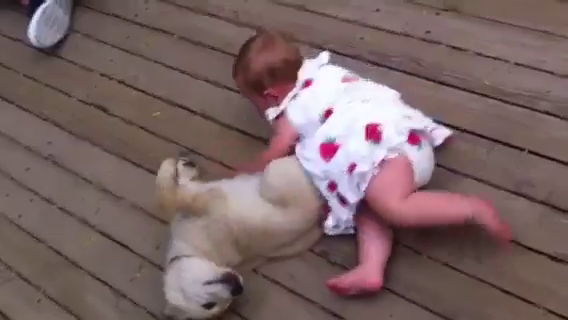 VIDEO Cutest interaction of 2 month old puppy and 8 month old girl. Responses to "Golden Retriever puppy delighted to see toddler (VIDEO)"
Lovely and cute, dogs are adorable "medicine" for all of us. But I love them anyway.